Police said Nina C. Adams, 47 was holding a gun when a Greensburg officer fatally shot her on her Grant Street porch Wednesday afternoon. Family members said she had mental health issues. Police said there is no video of the shooting. Neighbors called 911 after hearing gunshots and seeing Adams shooting a handgun in the road. One round shattered the glass front door of a Harvey Avenue office building. Four Greensburg officers arrived. One shot her with nonlethal beanbags, but she remained standing with the gun, investigators said. A second officer opened fire. 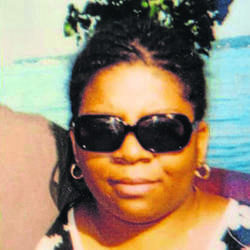 Adams later died from gunshots to the torso and shoulder at Excela Health Westmoreland Hospital. Her death was ruled a homicide, which is a cause of death not a criminal charge. The officer who pulled the trigger is not on patrol but working on paperwork, Capt. Robert Stafford said. Investigators declined to identify the officers involved. No one else was hurt. The family of a Greensburg woman shot and killed by police on Wednesday said they hold no ill will toward the officer who shot her.